This time last year Pedro Caixinha’s Rangers, ‘furnished’ with Niko Kranjcar and Eduardo Herrera, managed a truly impressive 1-1 draw with French giants Marseille. Indeed, that false dawn drew us in, suckered us into thinking our non-entity Portuguese manager had nailed a magic formula and suddenly we might even challenge at the top of the SPL. As we know in hindsight, this was as false an impression as it was possible to have so we are only too well aware of drawing any conclusions from friendly matches. When we look at the difference between the performance in that match on the 22nd of July compared with the one at Fir Park only two weeks later for the start of the SPL, it becomes stark how little we can take seriously a friendly – the aggression, pace and physicality of our hosts that afternoon left all XI players Pedro had selected completely lost. So with that in mind, with that cautiously in mind, we have to say what we saw on Friday was impressive. We draw no conclusions from it – we will measure much more accurately from the competitive action on Thursday against the Macedonians, but nevertheless as a dress rehearsal to see how our players would cope at Ibrox in front of 41,000 fans against a team likely to mostly defend, it went about as well as could be hoped for. Youngsters excelled and scored, defenders looked robust and reliable, while midfield motored nicely. 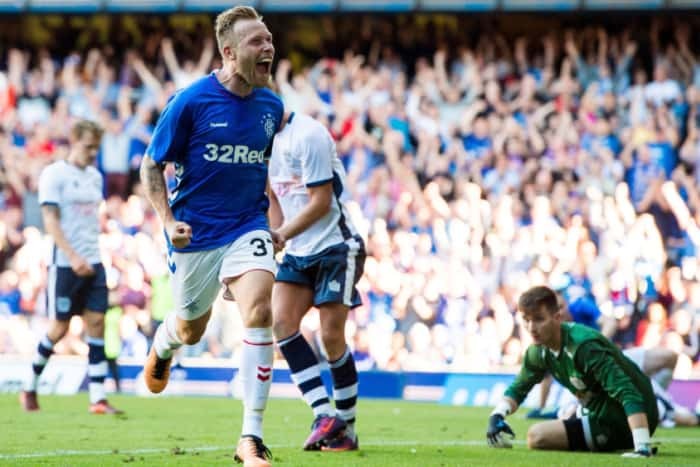 A number of players really did have impeccable maiden bows on the Hallowed Turf, with Glenn Middleton, Scott Arfield, Jon Flanagan and Nikola Katic the pick of a very impressive bunch. However the one huge thing missing from this match was aggression – not from Gerrard’s men – they worked hard and had clear hunger. But Bury were evidently not at Ibrox to put in a blood and thunder shift, and, coupled with their lowly League 2 status, were hardly a litmus test to take overly seriously. The SPL will be a different planet with regards aggression – we already know how physical our domestic league is so these more powderpuff friendlies can only help so much. Even Thursday’s UEL curtain raiser by comparison with what awaits us at Pittodrie next month will be modest, but certainly we can judge better on competitive action. That all said, we were still extremely pleased with the display last week – a Rangers team did what a Rangers team should – ruthlessly slaughtered a diddy team on our home patch, regardless of the match’s context. They played some good football and showed Gerrard’s ideas in full flow – fledgling, true, and we’re sure he’ll vary it plenty, but it was insightful. There’s a good feeling around Ibrox right now, probably the best we can remember since that illusion in February. Here’s to it continuing. Friendly results certainly can be misleading... I maybe harder to please than a lot, if not most supporters, but I didn't see much from middle to front to get too excited about. Indeed I would go further and say we need to improve massively in the creative department and for me I'm crossing everything hopin' that S.G. can wring some funding from somewhere for this area of the team. Conversely I was massively impressed with our new central defence... these guys looked the real deal. Sorry I meant to say Arfield was by far the pick of the midfield, wasn't impressed by any of the others and for me your Jack,Docherty and McCrorie aren't Rangers class. None of them would get anywhere near the unwashed midfield. Shug it is just about opinions ... but the results against them suggests otherwise. Oor midfield is lightweight and has been run ragged by a more dynamic forward moving opposition ... painful as that is, it's how I've viewed it. I honestly think S.G. knows this and that's why he's building practically a new team and one that I think will ease our pain if not this year then next. To paraphrase a well known saying; one swallow doesn’t make a summer; is how I sum up the Bury game. Taking everything into consideration that, Bury are at the start of their pre-season, Bury have just been relegated to the lowest division in the English league set-up, as the article highlights Bury players were less than enthusiastic to put in hard challenges, however Gerrard set his team up to go out an do a job on the opposition and the 6 - 0 thrashing could have been worse. I am sure the Bury boss wasn’t happy his side took such a tanking, although probably didn’t expect the rout. It is early days, very early days in fact, but Gerrard unusually made very few changes in the first hour, from my recollection Flanagan off and John on was the only change at half time, then slowly introduced further substitutions for the remainder of the game. I feel Gerrard might be fielding the starting eleven against Bury as his starting team against our Europa cup opponents. Highlights for me were the pairing of the two new centre halfs, Arfield, Murphy, Candias, Middleton and Rudden. Also the fact the movement of players was good, Windass, Morelos looked far more involved, Jack looked comfortable as did Flanagan and John looked raring to go too. Overall it was a good start I’d take a 3 - 0 score on Thursday. No repeat of last seasons debacle. Like the idea of swapping Fotheringham for Villa's McCormack . Also feel we still need a real hard case in midfield , too light weight in that area despite so many options to play there . Another centre back as cover also essential . Lets keep calm here guys.. We don't want to fight everyone !! We want to play round them and beat them all... WE do need another striker we do perhaps want to give Dorrans one more chance to get properly fit and be that creative player . Its all heading in the right direction we need to be patient and support our most noble club ...The off filed pish is once again raising its head with Ashley and the SPFL and SFA and Takeover panel bullying King... he has the money for f**k sake !!! He has shown the documents about waiting for Clearance we are not talking about 2 or three grand here !!!! its shocking that we have to suffer this pish Why Do They Hate Us So Much !!! !